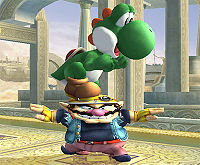 Yoshi lands on Wario's head. The Footstool Jump (踏み台ジャンプ, Springboard Jump), also known as a Stepping Stone Jump, is a technique in Super Smash Bros. Brawl, Super Smash Bros. 4, and Super Smash Bros. Ultimate. When characters are directly above another character, they can press the jump button to bounce off of the character's head. When used on a grounded opponent, it briefly freezes the opponent while they are in an animation of the player bouncing off their head. When used on an opponent in midair, it causes the opponent to tumble a set distance. It does no damage and can be used between two and six times in succession (depending on which character is used - a faster falling speed means that the character cannot footstool jump as many times), with each jump resulting in approximately half the rebound. Teammates cannot jump on each other unless Friendly Fire is set on (however, in Smash 4's Training mode, the CPUs can jump on each other). Like a normal jump, this jump can be short hopped. Players can also footstool off someone hanging on a ledge, but the character being jumped off will not fall and the footstool won't gain as much height. Pit performs this move in a cutscene in the Subspace Emissary. While said to be a meteor smash on the Smash Bros. DOJO! !, it does not actually function as a meteor smash, as it doesn't produce proper knockback nor can the tumble animation from being footstooled be cancelled early like a meteor smash can through meteor cancelling. However, if this results in a Fall, it will count as a KO for the footstooling player, even if no damage has otherwise been dealt for that stock. Characters who are sleeping cannot be footstool jumped until they are awake. Additionally, a footstool cannot cancel out an opponent's move that is in progress, regardless of if they're grounded or not. So if a footstool is used on an opponent that is in the process of performing a move, the player will do a footstool jump that cannot be shorthopped, while the opponent continues through with their move without interruption; this act is referred to by the competitive community as a phantom footstool. In Brawl and Smash 4, a fighter footstooled in midair is unable to tech upon landing from their tumble. In Ultimate, teching is possible. If Piranha Plant is footstooled while it is crouching, it will automatically attack whoever footstooled it, making it the only character with this trait. Footstool jumping is primarily used to gimp opponents when edge-guarding. It can also lead straight into meteor smashes with fast startup, such as Marth and Falco's down aerials. Footstools can additionally be used onstage to knock an opponent down, which can then setup for a free hit or one of the various locks that work on knocked down opponents, such as one of the many jab locks and laser lock. The bouncing animation on a grounded opponent is also long enough to hit the opponent after bouncing off, which can be used to land a free hit. Using the footstool to intentionally achieve these things can be difficult, due to its inability to affect an opponent that is performing a move. A more advanced application is using the footstool jump to aid in the landing of Marth's down aerial meteor smash. In Brawl, Captain Falcon and Zero Suit Samus can perform an infinite (and thus potential zero-to-death) combo on R.O.B.. Captain Falcon's combo begins with a neutral aerial, followed by immediately fast falling and performing a Footstool Jump on R.O.B. and repeating. When Captain Falcon racks up enough damage, he can use the Knee Smash as a finisher. Zero Suit Samus' combo can be done by starting with her down smash, then using the Footstool Jump on R.O.B., then immediately using her down aerial and repeating. Zero Suit Samus can also use her dash attack, forward tilt, the second jab in her jab combo, and/or the Paralyzer to mix it up as those moves have jab lock properties which can lead to finishers such a Plasma Whip. In SSB4, it is possible with some items to perform an infinite combo by footstooling an opponent, dropping the item on them to cause a jab reset, and repeating. Villager and Pac-Man can do this with their woodchip and Bonus Fruit respectively. In early versions of Super Smash Bros. for Nintendo 3DS, Zero Suit Samus can use her Paralyzer to perform a similar combo on Robin, due to gaining unusually little height after footstooling him; however, this was patched out in version 1.0.4. Mewtwo can also perform an infinite combo on most characters by canceling the footstool jump with Disable and using a well-spaced backwards facing neutral aerial. Perhaps most notably Peach is capable of an infinite footstool combo known as the "Umeki Rainbow", named after Smasher:Umeki who was able to perform it in tournament sets. The combo uses Peach's float to fully cancel the upward momentum of the footstool jump as well as the soft hit of her up air. Prior to version 1.1.5 the combo was possible on a large portion of the cast, but was nerfed such that it is now only possible on a few of the taller members of the cast. The Footstool Jump is very similar to one seen in Kirby Super Star and in Kirby & The Amazing Mirror, where Kirby could perform large jumps by jumping on the heads of his potential allies. It is also similar to how players can bounce on other players in some minigames in the Mario Party series. Luigi "footstool jumping" Mario in Melee. A footstool jump in midair. A footstool jump used for edge-guarding. A footstool jump in Super Smash Bros. for Wii U. This page was last edited on March 31, 2019, at 13:09.